These two teams had very similar styles coming into tonights match-up: they're both guard driven teams. 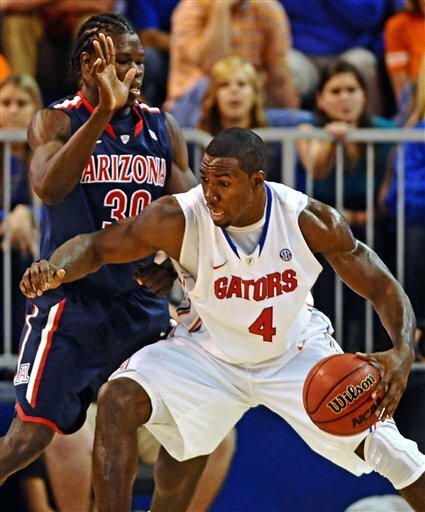 The Gators have Erving Walker and Kenny Boynton while Arizona has Nick Johnson and Josiah Turner, problem is Turner was suspended from Wednesday's game. The Cats hung in the game as they closed out the dual threat of Florida guards, however Patric Young dominated the point with 25 points. After building up a lead that vanished in the last few possessions, the Cats had a chance for the buzzer-beater down by one, but Nick Johnson dribbled the ball off his foot. The Gators then went up by three, but they fouled Solomon Hill. Hill made all three free throws and the game went into OT. The Gators proved that playing OT in an opponents home-court is never easy as the Gators pulled away.